Its indoor camping time. Timeline : September '17. We had two sponge foam (each 1" thick) mattresses, ever since kiddo was around 6-7 months. 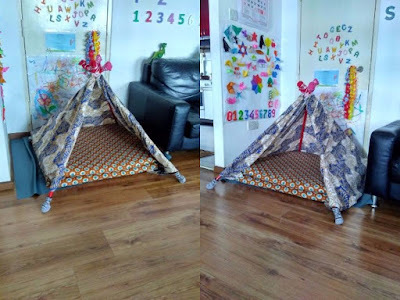 We initially joined them together using a duppatta and kept it on ground for kid while the kid learnt to crawl and later used it as a safety filler under her spring cradle. After the cradle era, the mattresses were stashed away for a long time, and in early September, we finally revamped the two mattresses - folded each one into half and stitched new covers - and voila, it easily made a kid's corner in the house. 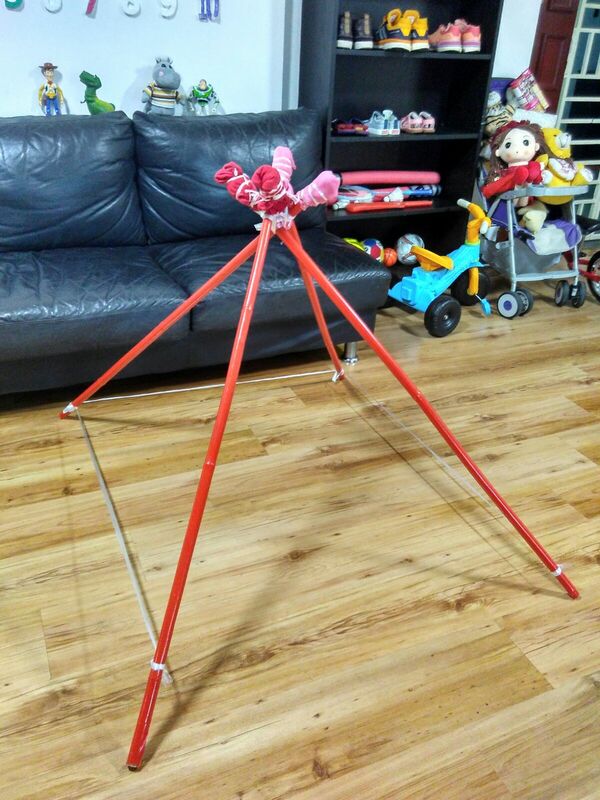 This gave us an idea about building a tent around it and make it a better toddler's-own-space. But we also wanted to be able to easily move it around everyday, while dusting and mopping the floor. 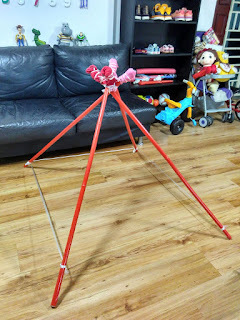 The ever creative father guy came up with an idea of how-to for the tent and we proceeded with the plan immediately. One evening was all it took, from planning- procurement -conditioning - building - wrapping. Raw materials we used, as below. Good mood and diplomacy skills - a lot, the kid wants to do everything, so had to ward off from time to time. Hooks/ Velcro - to keep the tent-wrap in place. We cut the poles into halves, making four poles for the kid size tent. Tied them together using diagonal knots that I had learnt in Girl Scouting decades back. Just re-inforced using plastic twines and covered the exposed ends on top with some old clothes. The skeletal structure is super sturdy [Fig. 2]. (1) at the top - this was very important, as it kept the bed sheet in place. On hindsight, velcro might have been a better choice and may change over to it, in future, when time and mood permits. The bed sheet length did not give room for too much flaps in the front. We also used some of the kiddo's old socks, padded it up and tied to poles as bushes - to prevent marks on the wooden floor. For the final layout, we used a Rexine sheet on the ground, as a safe cover for the mattresses, placed the tent and filled the inside with mattresses. Thankfully, it turned out to be an instant love for the kid, who would go straight from her bed in the morning to have some tent time. From time to time, we see kid bringing toys, books, bowl of popcorn, to the tent, enjoying her own time and space. The finished look is snapped below. Anouk's Vidyarambham on Sep 30, 2017. Morning 11:20 SG time.